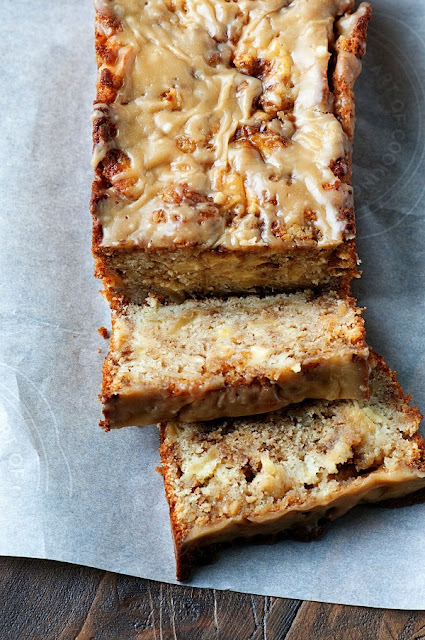 I have seen it all over Pinterest; Apple Fritter Bread. I had wanted to make it for a while now but just never did. I also figured since everyone else seems to have an Apple Fritter Bread recipe then I should put my own spin on it. Some say salted caramel has passed, I disagree. It’s too yummy to be a trend that goes away. Now kale…that can go die a slow death somewhere. 😀 So I made Salted Caramel Apple Fritter Bread and I think it’s the way to go. I used Trader Joe’s brand of salted caramel sauce but if you can’t find salted you can just use regular caramel sauce and add salt to your taste liking. The apples I used are my new favorites, Pinata. I made that awesome Caramel Apple Whiskey Crumble Pie out of them when I took a bunch from my dinner with Stemilt. They were kind enough do send a box of them this last week (this is not a sponsored post…it’s really my new favorite apple). If you can’t find them in your area I would try and go with a sweeter apple than tart since you have the salted caramel to cut some of the sweetness. I use a weird method for mixing the batter. I had it layered in one pan and then scoop it with an ice cream scoop to another pan. Why? Because I found this mixes things way better than just layering and swirling with a knife. As you can see by the photos the cinnamon swirl and caramel is pretty well mixed in there. You can just layer it and swirl if you want and don’t want to dirty two pans. I’m sure I don’t need to tell you that this bread was awesome. Use TWO (one for baking, one for layering) 9x5-inch loaf pans. Spray one with baking spray and leave one alone. Using a stand mixer with a paddle attachment cream together the butter and sugar until light and fluffy, about 3 mintues. Add flour, salt, and baking powder together in another bowl and add into creamed butter mixture and stir until blended. Mix milk into batter and beat until smooth. 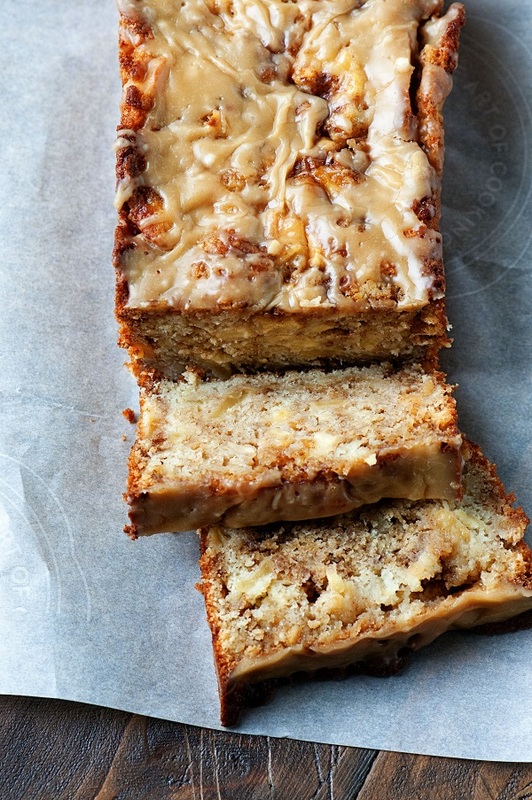 Pour half the batter into the non-baking spray loaf pan; add half the apples, then half the brown sugar/cinnamon mixture, then drizzle ¼ cup salted caramel sauce. Pour the remaining batter over apple layer and top with remaining apples, then the remaining brown sugar/cinnamon mixture and remaining salted caramel sauce. Using and ice cream scoop (or large spoon), scoop the batter into the prepared loaf pan. This helps with getting the yummy caramel and brown sugar throughout the bread and I find it works much better than just swirling with a knife. Let rest 5 minutes, flip out, and set on a wire rack to cool. Place that rack on a baking sheet for glazing. Let cool on rack for 15 minutes, then glaze. Whisk together the powdered sugar, salted caramel sauce, and milk together until smooth and there are no visible powdered sugar lumps. 0 Response to "Salted Caramel Apple Fritter Bread"